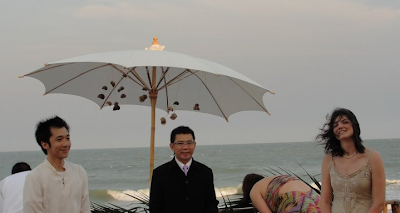 My friend Sarah, whom we took on a Snuggie Pub Crawl for her bachelorette party, recently had her destination wedding on a beachfront in Thailand (her hubs is of Thai descent). Doesn’t it look so simple and beautiful? And doesn’t she totally look like Jackie O. in that first picture? These photos are a nice respite from the supremely awful, miserable weather we’ve been having lately. Would you have a destination wedding? 1st: I love your blog! I enjoy your stories and random thoughts. 2nd: That looks so beautiful. I typically think "no" about having a destination wedding because not everyone would be able to come. But when you really think about it, that might be a good thing … less hassle. Your friend's wedding looks beautiful and she totally looks Jackie O.
I don't know how I feel about destination weddings either. They seem like a lot of fun but I don't know if I could narrow down my guest list that much. I think having a destination wedding is awesome, but I think it's probably best to have a wedding in a destination you are familiar with. That way it's easier to know the weather patterns, best locations, what kind of flowers are native and the local cuisine, etc. I hope to have my wedding in Hawai'i, but i used to live there so planning is much simpler 'cause I am familiar with islands. Oh, but I have to get engaged first…hahaha! ooh Hawaii… I would love to go there — I've never been! Hi BurntOutStreetlights, I'm not entirely sure since I didn't take these pics, but I believe they are all digital. Everyone always says its the lenses that make all the difference!